This sugar cookie recipe is sure to be a hit with family and friends. Although they make great Christmas cookies, sugar cookies are a delicious year round treat too. Cream the butter. Add sugar to it gradually and beating each time. Add egg yolk. Mix well. Add dry ingredients alternately with milk. Add vanilla. Chill dough thoroughly. Roll out on to a lightly floured surface to a thickness of about 1/4". Cut with cookie cutters. Bake on an ungreased cookie sheet at 375ºF for 8 to 10 minutes. Add 1 tablespoon of finely chopped or orange or lemon zest to the batter for a nice citrus taste. These cookies are so versatile. You can use your favorite cookie cutters to create great shapes to suit the season or the theme. Add colored icings and decorations to create a variety of beautiful cookies. Or – just bake them and enjoy. 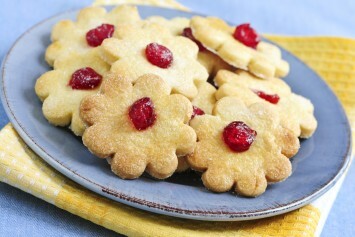 If you like this sugar cookie recipe, you’ll want to look at our other easy dessert recipes. You’ll find them here.